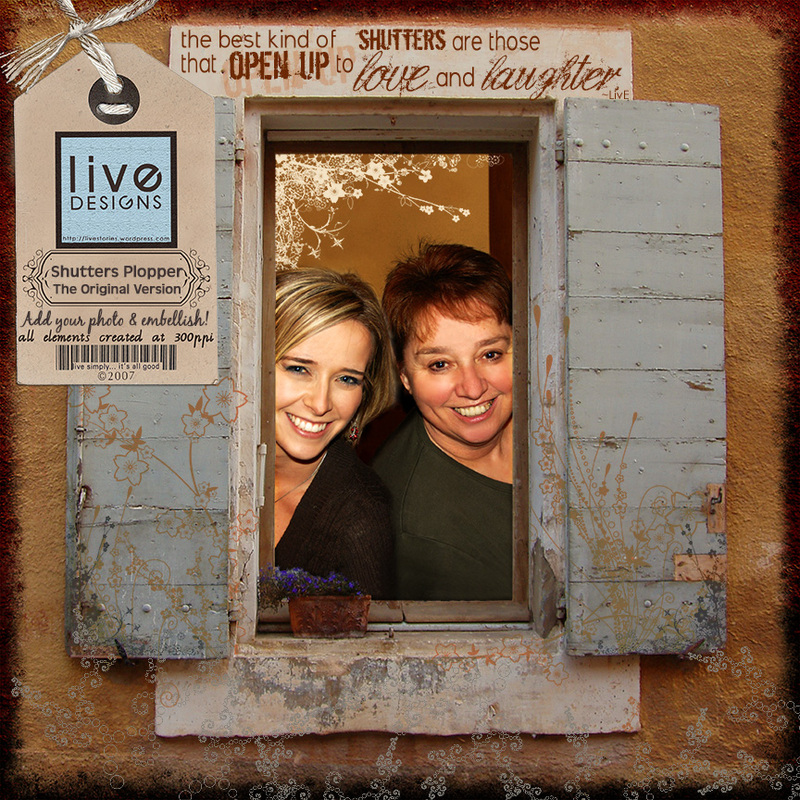 the original version of the shutters page plopper using Jason Gaylor’s awesome brushes!!! For those who downloaded the version I released earlier, this one has different brushwork AND it also has a slightly different, more sunshiny hue to it. Again, many thanks to Adam Lambert-Gorwyn for his windows photo, and Jason Gaylor for giving me the go-signal to release the plopper using his brushes! Download this plopper version here. Don’t you love acronyms? teeheehee. I missed out on posting my latest LOADs and DDs, so here they are. i love it when the parols begin to hang from trees and eaves. to me, nothing more warmly signals the advent of this season of joy and peace as the light shining from this truly filipino symbol of the star that shone above the manger on that first christmas night. Lately I’ve been getting into wanting to do full-photo-bleed layouts. This is what I came up with. This is my MIL. Pretty gorgeous for one who is beyond 70 years, eh? mom, can you gel my hair? i’m going to wear my jacket and my shades, and when my classmates see me, they’re going to say, wow, you’re sooo cool! sure, honey, let’s do that. but you know what? it’s not your hair nor your jacket nor your shades that make you cool. you’re cool because you’re a good boy. that’s what makes you cool, my little dude. hey, mom, where’s rudolph’s red nose? Also, look what I just found on the web today? 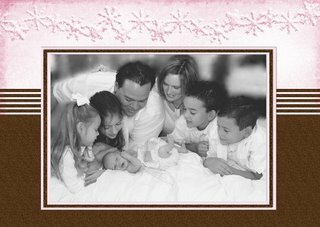 SLKozul used part of my Jolly Hollydays kit to make a birth announcement for her friends! So many stories, so wish to share! There are so many stories that I wish to share, but I have to stop myself before my post runs page after page after page! I’ll be back soon, though! Thank you so much, my dearest friends, all of you who offered prayers, well wishes, and words of advice for my Lasik operation. More stories about that soon! In the meantime, need to work on my LOAD for Day 9 … it gets difficult as I have to put my alien act to rest for a few days (meaning, I can’t stay up till 4AM as the eyes give up and force me to lie down. Those of you who’ve worn contacts: you know how it is when you’ve kept them on for too long, and your eyes feel dry and they sting a bit? That’s how my eyes feel after a while, except this time, I can’t remove the lenses and go aaaaahhhhh! The only recourse is to sleep. Thanks for the shutter qp! I love the new picture of Noel & Jackie–such cuties! I really love the shutters layout. Gorgeous! Have fun and thanks again for sharing! I have been missing chatting with you. With the kids back in school and my work picking up, I haven’t had a chance to do much playing. BTW- why do you call it a plopper? Cuz you can just plop a picture underneath it and be done? Makes sense to me! Love reading your stories and seeing your fab layouts, but best of all is hearing that you are finally resting those eyes! Smart girl just got smarter! Luv ya. P.S. thanks for the new shutter freebie. left some luv there for you. Now I just need to get scrappin…. Great Lo’s. How are you eyes going my DH is getting his eyes done with LASIK next month and he is so excited about it. See you over at Jessica’s forum. I am getting so ecited about NWR – not long to go now. Your LO’s are just so beautiful and how lovely is your MIL!! WOW!! Love the new version of the plopper, just downloaded it and left you some amor in 4shared! Thanks so much matey! Mmmmwwwwwahhhh!!! MWAH!!!!! Just wanted you to know I *heart* you! Love seeing your LOADs and hearing your sweet ‘life’ stories. It’s totally a breath of fresh air to read about your daily experiences. Thanks, as always, for the freeb. It is FABULOUS. So cool seeing Noel and Jackie there. Special friends.